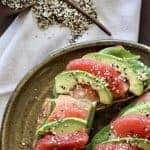 Sesame seeds, poppy seeds, onion, garlic and salt are crunchy flavor boosters to baked potatoes, hummus, scrambled or hard-cooked eggs, sandwiches, plain yogurt, popcorn, sliced cucumbers or tomatoes or avocado toast. Mix: all ingredients together. Store in airtight jar.